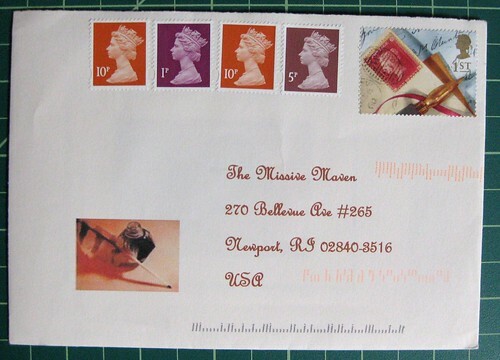 The lovely lady behind Postcard a Day sent me this fantastic letter-writing stamp. I hadn't seen it before, and I'm not sure I've seen it since. This has to be one of my favorite UK issues ever. 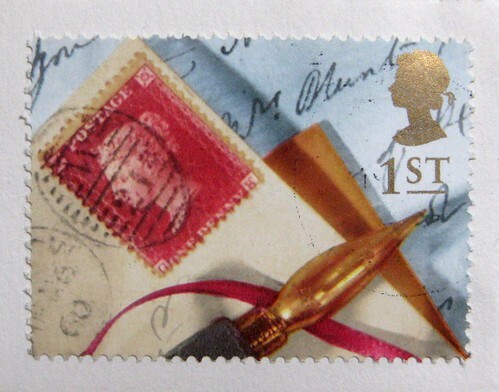 The envelope is decorated with this fine writing quill image, too. I do love me some good meta-writing stationery and stamps. This stamp is indeed really lovely! I'm glad you liked it. It dates from 1992. It was one of a booklet of several designs my husband had in his collection. I'm not sure why, but he decided it was no longer needed as part of the collection so I was allowed use them. I sent them out very sparingly. I love that stamp...I hope we can get some letters with that stamp on it.It's so pretty...they should offer more writing themed stamps around the world since nowadays most stamps are only used for letters since people pay bills online.